*Methodone is such a dangerous drug that dedicated clinics were set up around the country because patients could not be trusted with more than one day’s dose at a time; hence, the daily visit to the methadone clinic. Methadone is actually more dangerous than all prescribed narcotic painkillers and can threaten a patient’s life with each dose. As a matter of fact, a methadone user doesn’t have to be addicted to methadone to die from it—the very first dose can kill, unlike both heroin and morphine. These two ingredients — buprenorphine and naloxone –work in tandem assisting the addicted drug user in their intention to break a very strong habit. Like any drug that can successfully replace heroin, it is quite powerful and has some serious side effects. Just how does it work? As for adverse side effects, there are many and they can be severe. It has been reported that violent outbursts and aggressive acts of rage can be experienced while under the influence of Suboxone. There are other extreme and significant behavioral outcomes which can be exhibited by those who are under the influence of Suboxone which fit with the violent acts of the Charleston shooter. Charleston church shooter Dylann Roof was a known drug user who was caught with the powerful mind-altering narcotic Suboxone when apprehended by police during an incident on Feb. 28. The bottom line here is that powerful psychoactive and/or psychotropic drugs can push young people into all sorts of highly anti-social and destructive behavior. The presence of these drugs is rarely, if ever, discussed in the mainstream media in the wake of events like Charleston. The focus is always on the usage of a gun(s), rather than the radically altered state of mind of the shooter. The following article link contains a compilation of similar shootings and spells out a compelling narrative which seems to prove the direct influence of psychotropic drugs in these shocking episodes. It also points directly to the fundamental responsibility that ought to be shared by those pharmaceutical companies which manufacture and distribute these dangerous drug medications. 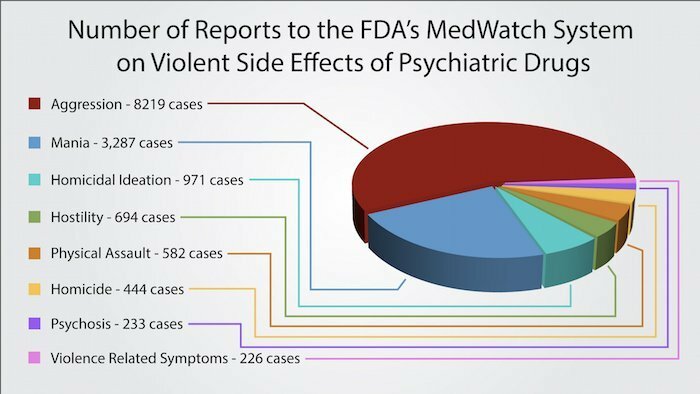 This investigative study provides an indisputable body of scientific evidence which clearly points to a causal relationship between various psych drugs and extreme violence. What is particularly curious is why the government never addresses these quite obvious correlations. Instead, the authorities only speak to the utilization of a gun in the commission of the crimes. Perhaps the time is now to shift attention to the dangerously mind-altering pharmaceutical drugs which regularly trigger this unacceptable conduct. The guns will always be there, just as knives will always be available. Therefore, only by addressing the root causes will this epidemic of shootings be brought to an end.